This project might count as both a twist and a tie, depending on how you style it! For my next Sew Twists and Ties project, I bring you this delightful Meridian Dress. This pattern was one of the patterns that originally inspired me to kick off this challenge! The fabric is a buttery soft tencel gabardine from Hart's Fabric... this stuff is excellent! Not dissimilar from tencel twill (maybe a little bit heavier weight? ), the tencel gabardine has a heft and drape that can't be beat, perfect for dresses, blouses, pants or skirts. It has that slightly washed/sueded look to it that I love. The colorway for this tencel gabardine is maroon, but its one of those chameleon fabrics: sometimes it's red, occasionally purple, brown in certain lights, and rusty in others. No matter which shade it is, it's lovely. And somehow I have a pair of booties that are almost an exact match! So back to the Meridian Dress, which is a Papercut Patterns design. I was immediately smitten with this pattern when it came out, and all the versions popping up on Instagram since did not diminish my enthusiasm for it. This is a size XL, and I opted for the shorter skirt and long sleeves. I was a good girl and did a muslin of the bodice before getting started. The muslin showed a few minor fit issues. The upper back was pulling when I put my arms forward, and I could tell it was only partially due to the sleeves being ever so slightly tight through the bicep. There was also a hint of pooling at the lower back. I consulted my handy fitting book, the new iteration of Fit for Real People, The Palmer/Pletsch Complete Guide to Fitting. I decided I needed a full upper back adjustment (+1/2" on each side), a 1/2" swayback adjustment and a 1/2" full bicep adjustment. Worked a treat! That was my first time doing the full upper back adjustment. Pretty easy. Perhaps I didn't need to do both the full upper back and full bicep... the sleeves are pretty wide. My muslin also let me know that I didn't really need the zip up the back, so I skipped it out of laziness. I just sewed right up the center back seam and altered the neck facing to match. The Meridian dress was quite easy to sew, made even easier without the zipper. The only issue I ran into, construction-wise, is that I ended up with a small hole between the two dangly ties. Despite my best efforts when sewing the bodice to the skirt, I couldn't sew up that hole by machine, so I did it sloppily by hand. Good news is that no one will ever see the hole because of where it sits, buried underneath the ties. I certainly won't wear the ties undone because a) it's definitely a tripping hazard and b) it looks like if Snuffleupagus were a conjoined twin, I shaved him and I turned him into a dress. Try getting that image out of your head, friends! c) twist them in the front, then tie in the back. That third option makes it possible for me to count the Meridian dress as both twist and tie for purposes of the challenge! Not that anyone is counting anything in this challenge- it's pretty flexible! 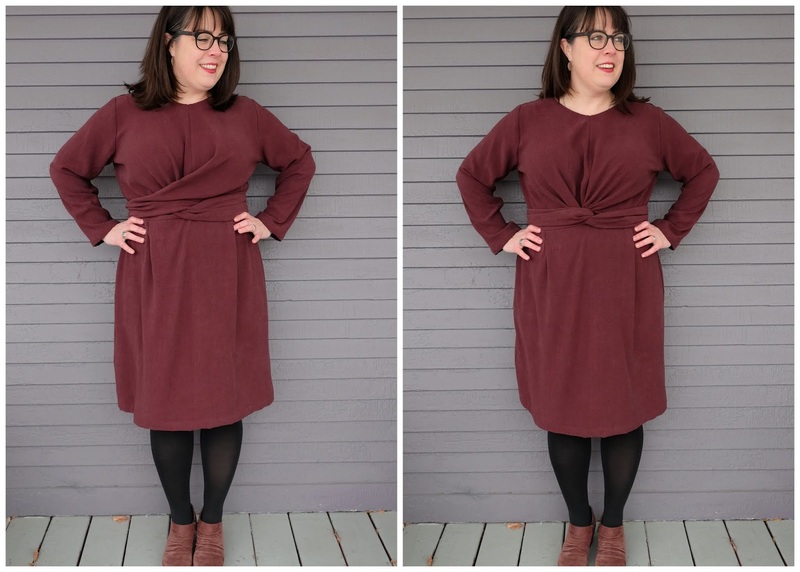 I just adore my tencel gabardine Meridian dress! It's comfy and interesting, and it makes me feel pretty chic. Plus I am feeling pretty chuffed about having successfully made some new-to-me pattern adjustments. Winning all around. I'd love to make a summery version out of linen in a few months, maybe with a v-neck hack like I've seen a couple people do on Instagram. I love it when I see a pattern that didn't really interest me, made up on someone else...and then I want to buy it right away! It happens all the time. This is a great dress. It looks perfect for staying warm and going to work. Thanks for sharing. This dress looks wonderful on you, Meg! I have the Meridian pdf on my sewing table now, trying to plan out what adjustments I will need. Your notes are super helpful, as I am a similar size and it makes such a difference to see it on someone else like me. This is such a nice dress on you! Thank you for sharing your fit adjustment. I think I need something similar on a project I am working on, and I have that book too! Whaaaaaat I did not expect the untied shape to be THAT! The color is gorgeous, and the dress (twisted or tied) is too!